Growing up, we weren’t routinely allowed to eat junk food, sugary cereals, pop or anything like that. My parents didn’t keep stuff like that in the house and the closest we got to “fun” cereal was Frosted Flakes. But every once awhile we got to enjoy a treat. One of the things I always loved eating was a box of Cracker Jack. I mostly attribute it to my unbridled infatuation with peanuts and peanut butter. Those little caramel-covered peanuts were little bits of heaven. In fact, when I realized that there were no more peanuts left in the box, it was always a slight letdown. Sure, I still enjoyed the caramel popcorn, but the more peanuts the better! 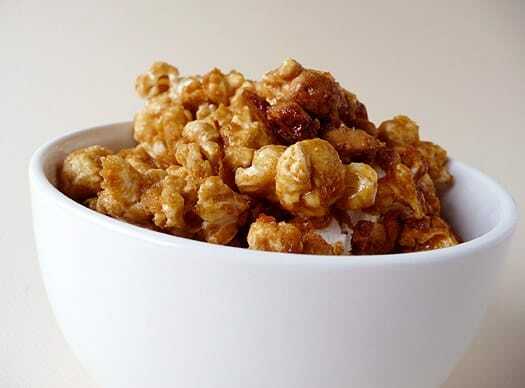 Homemade caramel peanut popcorn has been on my list for some time, and I am chastising myself for not making it much, much sooner. This is perfect for packing up and taking with you to the ballpark, stuffing in your purse and sneaking into the movie theater (shh! ), eating at home while lounging on the couch, or for packaging up and giving away at the holidays. Bottom line – there is no bad way to enjoy this. And it’s heads and tails better than the boxed original. 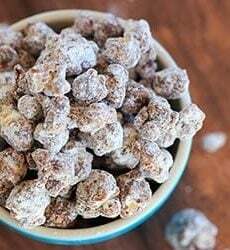 This popcorn is actually very simple to make and the only piece of specialty equipment that you need is a candy thermometer. This is the one I own, and it’s definitely worth its weight in gold. Just think – if you get it, then you can also make the Ale and Pretzel Soft Caramels! To make the caramel, all you do is whisk together the ingredients, let it simmer away and wait for it to hit 250 degrees. Pour over the popcorn, mix in the peanuts, and then pop it all into the oven. Then, sit back and be prepared to be completely and utterly addicted. Don’t say I didn’t warn you! Note: You can use microwave popcorn for this (I would go with plain or “homestyle” – you don’t want that fake butter flavor here), but I definitely prefer popping the popcorn fresh. 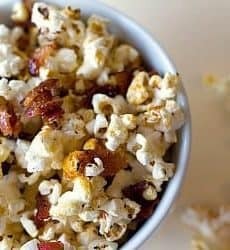 If you’ve never done it before, check out my tutorial on How to Make Perfect Homemade Popcorn (omitting any butter and salt). 1. Preheat oven to 250 degrees F. Line a rimmed baking sheet with parchment paper; set aside. 2. Pop the popcorn. 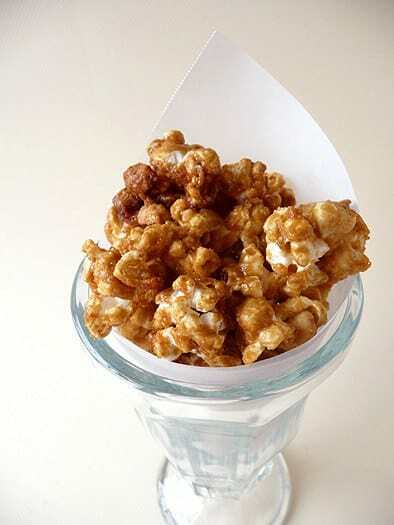 Coat a large mixing bowl with nonstick cooking spray, and then transfer the popcorn to the bowl; set aside. 3. In a small saucepan, whisk together the brown sugar, corn syrup, butter, salt and water, and bring to a simmer over medium-high heat. Continue to simmer, stirring often, until the mixture reaches 250 degrees F on a candy thermometer, about 3 to 5 minutes. 4. Turn off the heat, and whisk in the vanilla and baking soda. Immediately pour the hot mixture over the popcorn. 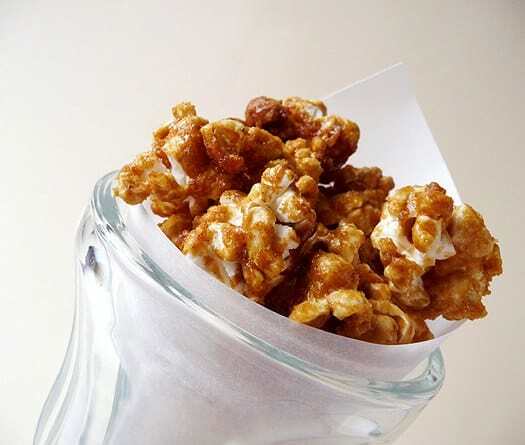 Use a rubber spatula to gently fold the caramel into the popcorn until all of the popcorn is coated. Gently stir in the peanuts, and transfer the mixture to the prepared baking sheet, spreading it out. 5. Bake for 1 hour, stirring every 20 minutes. Remove from the oven, and cool on a wire rack for 20 minutes. Gently break up the popcorn. Serve immediately, or store in an airtight container for up to 5 days. Hey…anyone actually tried this recipe? Good ? average? Most replies are in a response to how it looks/appears. 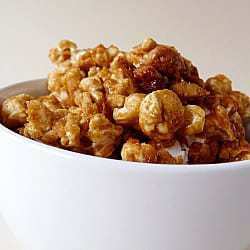 I was craving caramel corn last fall. I have us used a couple other recipes from your blog and they always turn out awesome, so came here to see if you had a recipe. Love this! I cannot tell you how often or how many times I have made this. 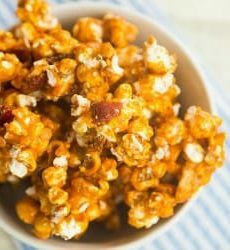 I have started to use puffed corn instead of popcorn (my mother cannot eat popcorn, so she can enjoy it too), though use about 8 cups as the puffs are bigger than popcorn. I have been playing with the flavoring. I have added whisky at the end with the baking soda and vanilla. Looking for some other fun flavors to add, right now it has a bit of brandy in it. With people complaining about it not being traditional crackers jacks, I am wondering if using some molasses in place of the corn syrup would work. I might have to try this. I also like using dark brown sugar for a more rich flavor. I followed the recipe to the letter, it looked so good but after the first 20 mins in the oven the caramel started to go black. So I started again and turned the oven down to 175, again the same thing happened, I am using high quality ingredients and Reynolds parchment paper. What am I doing wrong? Hi Lisa, I would make sure that your oven isn’t running hot by placing an oven thermometer inside. There’s no way it should be burning at 250 degrees F.